Kidical Mass Tacoma: Kidical Mass Tacoma - Coming Soon! 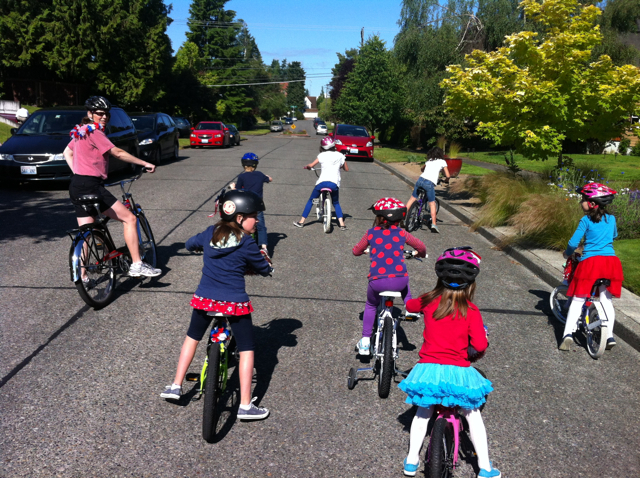 Kidical Mass Tacoma - Coming Soon! I've been talking to parents around town for at least a year, gauging interest in a monthly family-oriented bike ride. The interest is there. Parents want to find more opportunities to ride with their kids. What is Kidical Mass? It's a casual bike ride for people of all ages and abilities that gives kids an opportunity to share the road. Kids are traffic, too! The goal is to introduce children to cycling in a fun, safe, and low-key atmosphere. We'll ride in a group and leave no one behind, use quiet side streets, have volunteers stationed at arterial crossings, have snacks at the end (and maybe before), and hopefully have some sort of theme that makes the whole thing more exciting. Rides will likely be out-and-back loops at first, starting and ending somewhere fun: a playground, a donut shop, or even a beach. The rides also give parents a chance to share ideas on what works when it comes to family biking setups (cargobikes, and trailers and trail-a-bikes, oh my! ), share tips on teaching kids to ride, and create a support network or riders who are willing to nurture everyone's enjoyment of cycling. Obviously there's a tongue-in-cheek reference to Critical Mass, but really this is all about having a good time. I'm posting this announcement early because I will need some help. I'd like to determine a summer's worth of dates, locations and routes before the first event so that participants can plan ahead and spread the word. We're looking at hosting a monthly event May-September. Where would you like to ride? We will need volunteers to help at the start-finish location during the ride (clean-up/prep), and also a few folks to help stop traffic at any busy crossings. Most of these routes will be through neighborhoods, but we'll have to cross an arterial somewhere along the way no matter where we go. And someone must bring up the rear, a sweeper. Can you do one of these tasks? Could your spouse do it while you're on the ride? I'm handling logistics with the City (liability insurance is required if they are promoting the event as part of Bike Month), and also doing some preliminary searching for potential sponsors as we move through the summer. Would you or your business like to be a sponsor? This could be snacks, beverages, bike decorating materials, helmets, money for event insurance, etc. If you answered YES to any of those questions, or have some ideas, send me an email at matt (dot) newport (at) gmail (dot) com. Comments are helpful, too. I'll continue to post updates here on TBR and the giant Kidical Mass button on the right will take you to the posts related to the rides. If the response is big enough, maybe we can even get a ride going in April. I don't know that I can wait until May. Some ideas for rides: Jefferson park to Proctor for treats (Sugar Candy Shop, Frozen Yogurt) or a movie (maybe we could coordinate something with the Blue Mouse, Pee Wee's Big Adventure!) or Jefferson Park to Legendary Donuts on 6th Ave. I'm so glad you're doing this, my son and I ride home from school every day, but it's always just his lone bike in the bike rack, it'll be so much fun for him to get a chance to ride with other kids, can't wait. Those are great ideas, Amocat. I look forward to meeting you on the ride, but feel free to reach out via email if you want to talk about getting more kids biking to your school. 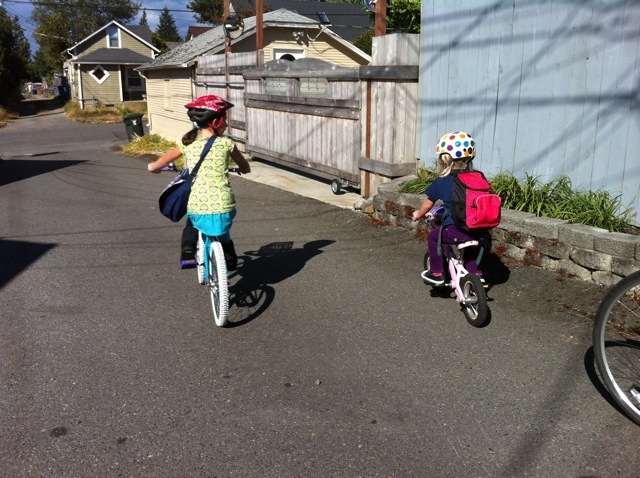 I'm hopeful that this summer ride series will blossom into an increase in bike-to-school traffic in the fall.